Please complete all the fields of the demo registration form. Once the form has been submitted an email will be sent to you with a confirmation of your new demo user account and password. 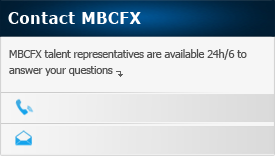 Your free MBCFX demo account helps you to practice and learn your Forex trading strategies while using our FX trading platform.